3 oz. regular size glycerin shaving or cleansing round in your choice of unscented or with our Em's essential oil blend is great for use with a shaving brush and is the refill size for our shaving sets (or use your own container). 2 3/4" approx. diameter. Enriched with extra glycerin. Can be used for gentle face or body cleansing too! What could be more convenient. Why does Em's promote glycerin soap? 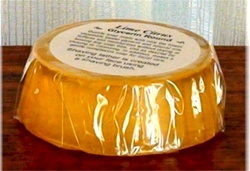 Our glycerin soap is made using only the finest ingredients and essential oils for a masculine scent and beneficial for skin care. It lathers well and provides a nice shave while rinsing clean. We have had a lot of positive comments on this soap formulated for all skin types, especially sensitive skin. Not only is it a good shaving soap, you can bathe and shower with it too! FAQ: How to keep soap from sliding around in an oversized mug/bowl? For our glycerin rounds there are several methods suggested. A) Having a second one that can be cut/grated and then used to pack down between the soap round and the inside of the bowl. That way it expands the diameter of the soap via this added soap and it works great. B) You can take the container with soap in it and put in a microwave (if microwave safe like ceramic) and just melt a slick (not the whole thing) a little bit to puddle on the bottom so when it dries it will hold things in place. C) You can put the container with soap in a little pan that has water on the bottom, place soap container in the pan/water and melt a little slick on the stove top (for example if the container is metal and not microwave safe). D) Some of the palm bowls are sized for the rounds, and in that event, after a few uses soap sliding around isn't really an issue anymore and doesn't need any special adjustments. It's all about the water - too much and you get bubble water, too little and you get dry film and insufficient lather. Generally speaking, it is not a thick interfering foam like what is found in store brand shaving canisters, but rather a layer that allows the razor to slide along the face without too much foam to get in the way of a close shave. You can control the amount of lather created by how much water remains in the brush, how much soap or cream is applied to the bristles and the scrubbing motion used on the shaving area. Experiment and you will find what works best for you. Soap or Cream? More info... Also visit the FAQ for more information. I have been using these shaving soaps for over 15 years and I am very pleased. I actually look forward to shaving as part of my morning routine. I use German-made twin edge blades on a Merkur razor handle, a badger shave brush and Em's glycerine rounds soap. Highest recommendation. Your soap, my Dovo, strop and everything I needed has been past my expectations. I used an English soap last and ran out. There was some left in your container so I used it. It is far and away a better product than my last soap. I like how it makes the soft creamy bubbles, and how long they stay on my face. I get a warm lathering and with my Dovo, I get a really nice shave. So, thank you Em, you're the best. It lasted a long time too. First I am a tallow man. Tried two of the best rated glycerin and tossed them and was not trying another. Looking in my shaving soap box, enough for 10 years :) I forgot l purchased this from Em's. Since never a disappointment here, I broke down and put it too work. Does everything as good or better as what is in my box. No names but all top soaps and I give my money to the small hard working local US shops. I toss what isn't up to my standards. This is a fast shave, in fact the fastest. All you need is distilled water, brush and shaver. Brush loads at light speed with thick lather. Face lather that works for once. Face lather, milk some thick cream off my brush to put over that. Shave. Glides fast and no nicks. If in a hurry there is nothing faster or easier. True working man's soap. One pass if you want. Plus the price is right. I ordered the round shave soap and I am very pleased with the quality. Simply the best I have ever used to shave. I have even tried the British high end brand and Em's product is tops. Great lather, long lasting and leaves my face smooth. I received the minty menthol shave soap a few days ago. The scent should be named double mint because it smells very similar to double mint gum. I can say the shave soap is very good. It gives enough glide during the shave and it leaves my skin moisturized post shaved. Now you can either buy this soap or spend your money on the name brand stuff. I have put off trying a hard soap for a while because I felt that building a lather on my face (as recommended on the soap wrapping) was kind of rough on my skin. At least, I have had troubles with skin irritation when I did face-lathering with some creams that I own. But I just now tried Em's soap and my face feels great! I paired the soap with the pre-shave oil and my skin felt completely protected from the blade. The razor felt like it really glided against my face. Even the trouble areas on my neck are smooth and free of irritation. I have to admit, I'm impressed. This is good soap. I almost wish that I could shave again today just to feel the quality a second time. Unfortunately, my face is so glass-smooth that I might have to wait a while to use this soap again! In summary, I was skeptical, but now I am a convert. Emily has a good system going here.